Welcome! You are at the 174th Alumni Association web site. An association that is comprised of former members of the tentant units such as; 138th FS, 174th TFW, 108th AC&W Sq, and the 152nd AOG Sq.,274th ASOS,222nd. The Alumni Association is dedicated to the preservation of the memories of those who served before us and the heritage of the base we served on. This web site is a service provided to it's members that are in good standing. The majority of this site can only be accessed once your registration request has been approved. If you were ever a member, even for one day, and now have left or are now a member of one of the organizations listed above, still serving, you are eligible to join the Alumni Association by sending in the Membership Form that can found by clicking "Membership Form" selection on the left menu. Every Third Thursday @ the Heritage Room (All Services Club), 7 pm. The 174th Fighter Wing was formed on 28 October 1947 as the 138th Fighter Squadron (FS). 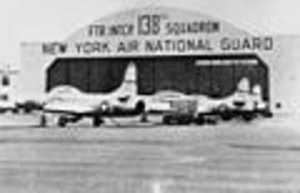 The 138th FS was the first post-WWII Air National Guard flying unit in New York State. The unit flew P-47D Thunderbolts and was based at the former Army Air Force facilities at Hancock Field. In 1950, the unit became the first jet - equipped flying unit in New York State with the assignment of F-84B Thunderjets. The base became the main training hub in the State for jet fighter aircraft. In 1957, F-86H Sabresarrived and the 138th FS was assigned to Tactical Air Command, starting its long history of performing the close air support mission.